1. Season the sliced onion with the salt and mix together. After about 15-30 minutes you’ll find that the juice will start to drain out of the onions. 2. Meanwhile mix the flours, melted ghee and lemon juice in a bowl, then add the spices, herbs, garlic and ginger. Add the water and continue mixing to form a paste. 3. Drain the onions and squeeze them between kitchen towels to remove any excess juice. 4. Add the onions to the bowl with the paste and mix well. Allow the mixture to stand for 10 minutes. 5. Place a large flat frying pan, approximately 25-30cm in diameter, over a low heat, then add some ghee. 6. Tip half of the onion mix into the pan and spread out evenly. Cook through, turning once, but don’t allow to caramelise. Repeat to make the second pancake. 7. Tip the pancakes onto a tray lined with parchment paper and allow to cool. 1. Mix all the ingredients together, then season to taste. 1. Remove the sausage meat from the skins and mix together. 2. Place one of the onion pancakes into the centre of the unrolled pastry sheet. 3. Spread out half of the sausage meat into a cylinder 4cm in diameter and the length of the pastry sheet, and place on top of the pancake, along the top edge. 4. Brush the beaten egg onto the inside edge of the pastry, then roll the sausage roll up tightly, trimming away any excess pastry. Crimp the seals with a fork. 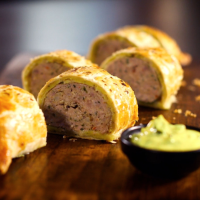 Brush the outside of the sausage roll with the beaten egg and dust with the crushed cumin seeds. 5. Repeat to assemble the second sausage roll. 6. Transfer to a baking tray and bake in a preheated oven at 190°C, gas mark 5 for 30-35 minutes, rotating the tray after 15 minutes. Ensure the sausage meat is piping hot throughout. 7. Remove from the tray, transfer to a cooling rack and allow to stand for a couple of minutes. Serve with the spiced mayonnaise.